Cookie butter!!! Have you all tasted this delicious stuff? Definitely heaven in your mouth! Some people I know cannot get enough of this delicious, creamy goodness. 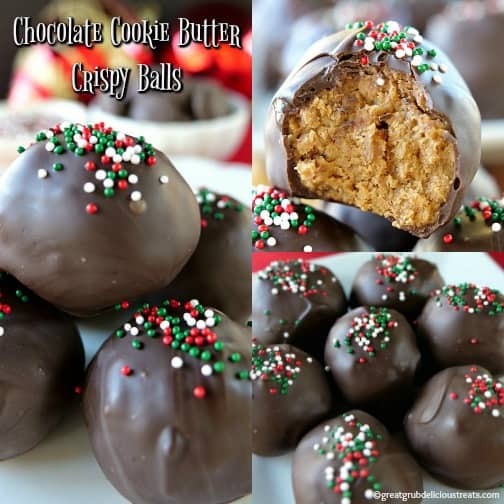 And, these chocolate cookie butter crispy balls are made with the amazing cookie butter. Oh yeah, SO GOOD! 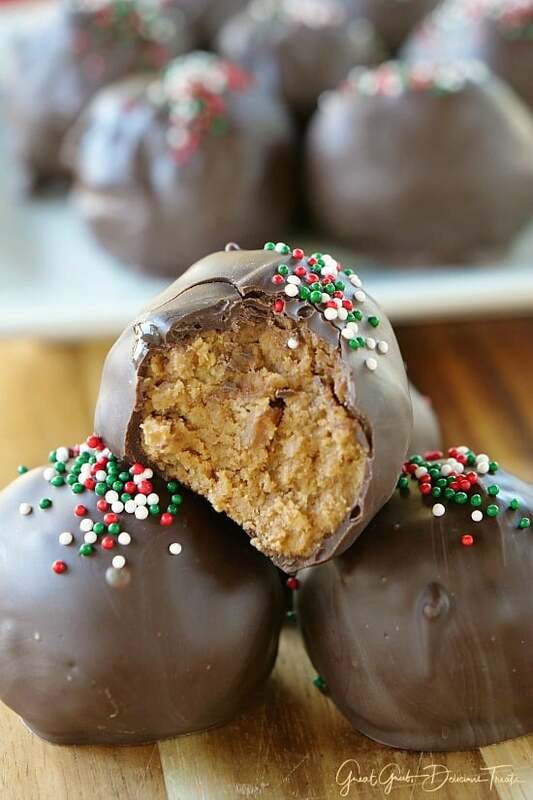 Biting into these chocolate cookie butter crispy balls will have you wanting more. 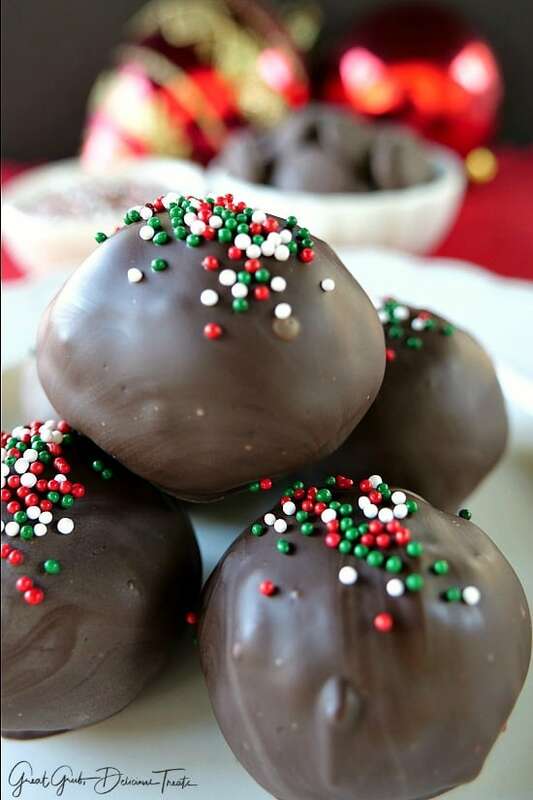 And these are perfect to add to the holiday cookie/baking list and perfect for cookie exchange parties. Cookie butter starts with Speculoos cookies, which are spicy, crunchy Belgian cookies, that are slightly caramelized, baked and then crushed and mixed with other ingredients to make it spreadable just like peanut butter. So DELISH! I made some Cookie Butter Rice Crispy Bites (which I’ll post soon) and took them to work and offered those tasty treats to my co-workers and our Medical Director and everyone LOVED them, so I decided to make these with the dark chocolate. And… SO DELICIOUS as well. Just look at these babies. 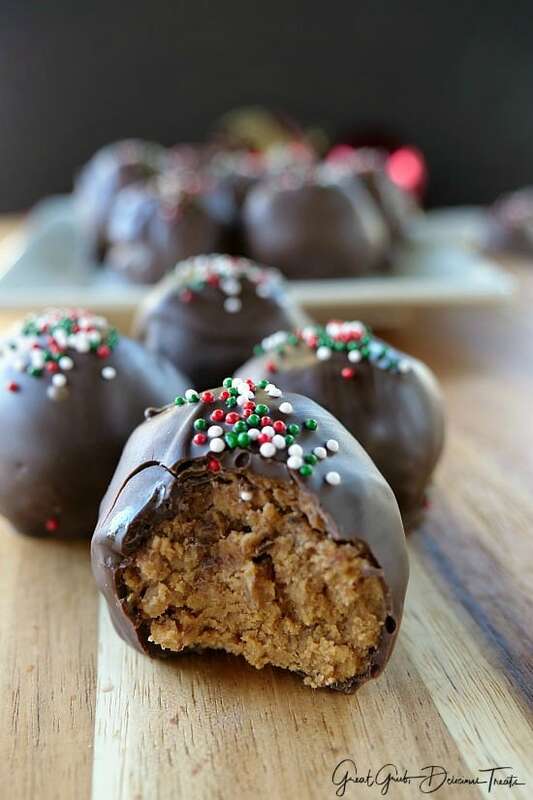 With each bite you are getting that delicious cookie butter taste as well as the crunch of the rice krispies all wrapped up in a delicious dark chocolate coating, topped with candy sprinkles. Talk about delicious! Super tasty, super easy and everyone will LOVE these yummy treats. Pop one in your mouth and you will be addicted! And if you have never heard of cookie butter, this amazing stuff can be found at Trader Joe’s® or your local grocery store. 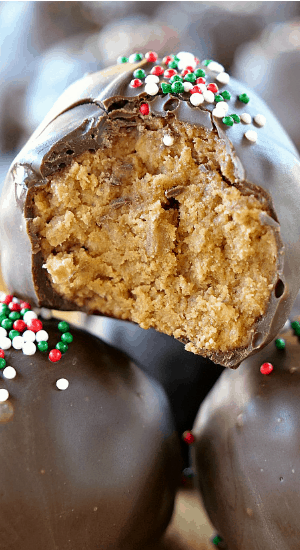 Here are a few more tasty treats you can find on the blog: Butterscotch Peanut Butter Crispies, Cashew Toffee Butter Crunch, Butterscotch Crunchies, and how about some Homemade Caramel, plus many more. Check them out and all the other delicious recipes. Add rice krispie cereal to a large baggie. With a rolling pin, crush slightly. Set aside. In a medium mixing bowl, add cookie butter, powdered sugar, melted butter. Stir. Add rice krispie cereal to mixing bowl, and with clean hands, mix until incorporated. Using a 1" cookie scoop, place each cookie butter crispy on wax paper or parchment paper. 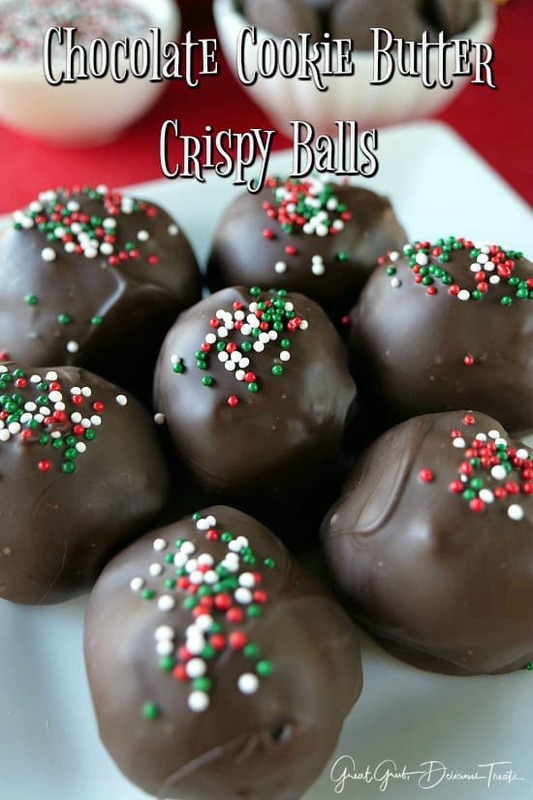 Melt chocolate wafers according to package directions and place a few crispy balls at a time into the chocolate. 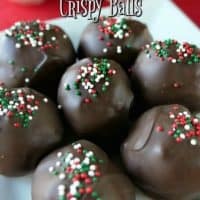 Using a spoon, make sure each crispy is completely covered and then place on a cooling rack with a baking sheet underneath to catch the dripping chocolate. 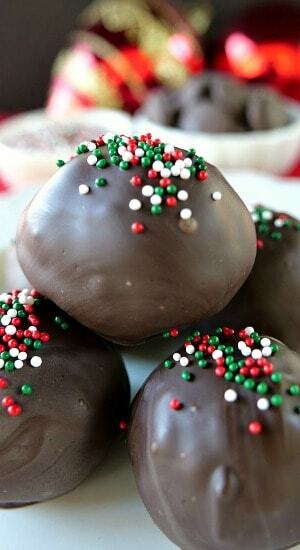 With the remaining chocolate, pour over the balls and then in a minute, top with candy sprinkles. Chill for about 10 minutes then remove from cooking rack and place on wax paper and chill again. What is chunky cookie butter? I think it is basically just a peanut butter. I clicked on the Trader Joe’s in italics and that is what it look like to me anyway. Hi Ann, yes you sure can. Enjoy! ? They sound and look delicious! What is cookie butter? Cookie butter starts with Speculoos cookies, which are spicy, crunchy Belgian cookies, which are slightly caramelized, baked and then crushed and mixed with other ingredients to make it spreadable just like peanut butter. o.k. what is cookie butter?